An antique woodcut engraving prepared for the front page "The Graphic" newspaper published, Saturday January 21st, 1888 with later hand colouring. Scenes include Isglau Farm, Holywell, Mostyn High Road and Pentre Ffynon Farm, Whitford. An antique woodcut engraving prepared for the front page "The Graphic" newspaper published, Saturday January 21st, 1888. Scenes include Isglau Farm, Holywell, Mostyn High Road and Pentre Ffynon Farm, Whitford. Later coloured by hand. An antique aquatint engraving published London, by Thomas McLean, Haymarket in 1823 with original hand colouring. 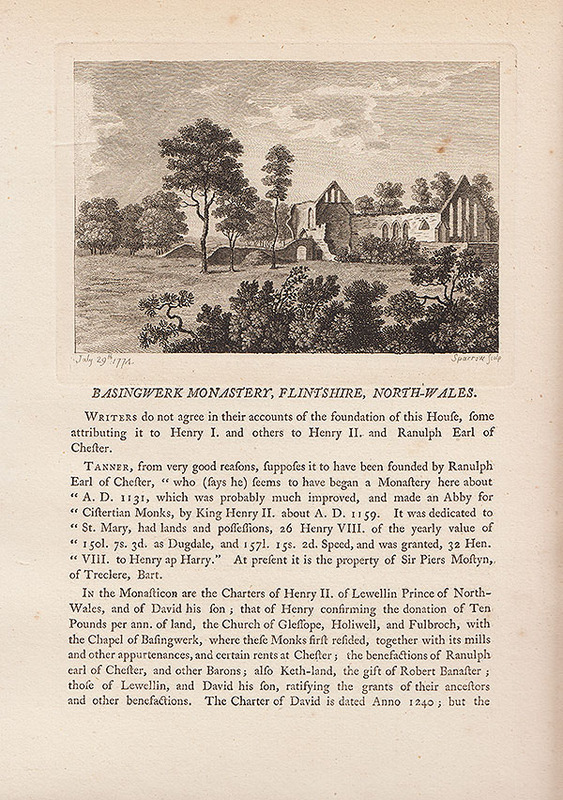 An antique line engraving published by Charles Hughes, Printers, St. Asaph. 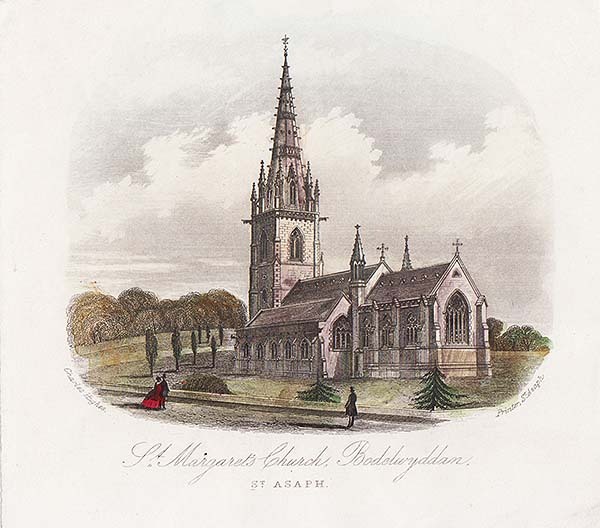 Circa 1860 with later hand colouring. The North West view of Caergwrley Castle, in the County of Flint. 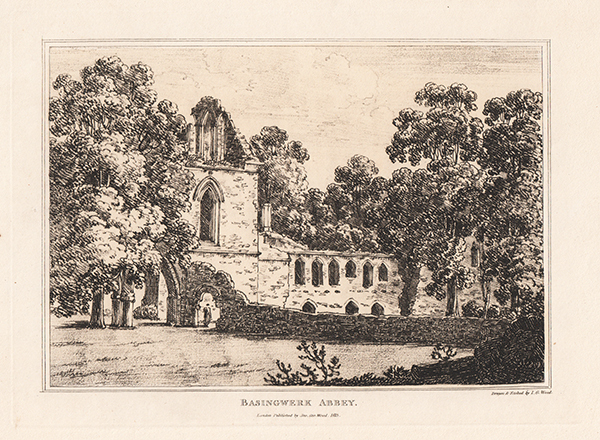 The North West View of Basingwerk Abby, in the County of Flint. More Info An antique copper-engraved view from the historic work of the brothers Samuel and Nathaniel Buck, 'Views of Ruins of Castles & Abbeys in England, 1726-1742'. They were the most important topographical artists of the 18th century. More Info An antique copper-engraved view from the historic work of the brothers Samuel and Nathaniel Buck, 'Views of Ruins of Castles & Abbeys in England, 1726-1742' with later hand colouring. They were the most important topographical artists of the 18th century. An antique copper-engraved view from the historic work of the brothers Samuel and Nathaniel Buck, 'Views of Ruins of Castles & Abbeys in England, 1726-1742' with later hand colouring. They were the most important topographical artists of the 18th century. An antique aquatint engraving by T. Bonnor after Edward Pugh. Published 15th July, 1813 with original hand colouring. 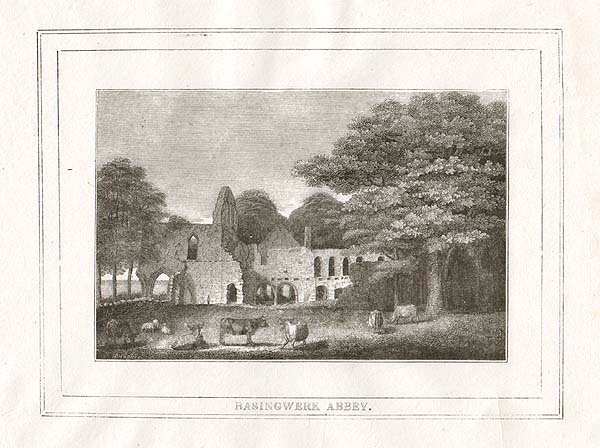 Basingwerk Monastery, Flintshire, North Wales. An antique line engraving by Sparrow published by S. Hooper July 29th, 1774. Description included in text below image which continues on verso. 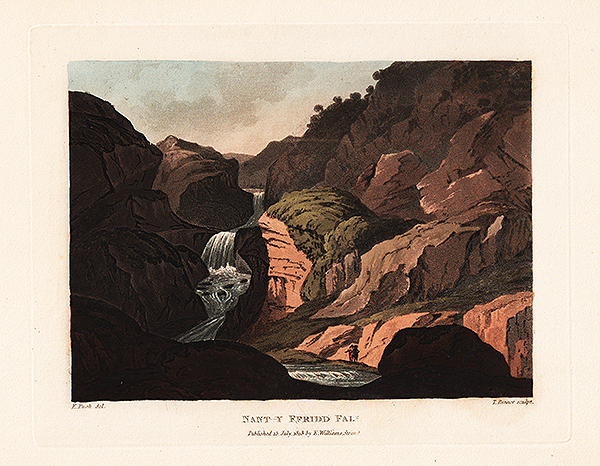 An antique line engraving by Sparrow published by S. Hooper September 29th, 1786. Description included in text below image which continues on verso. 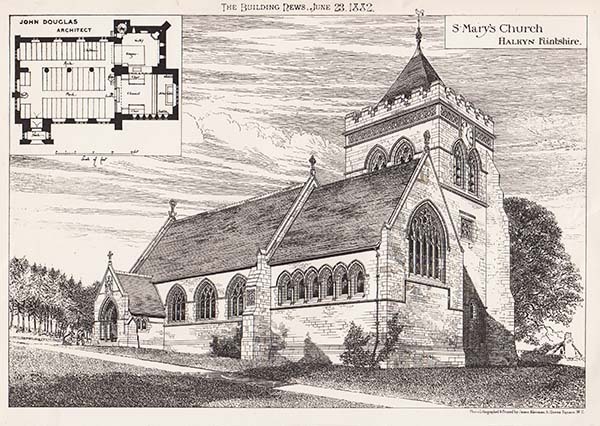 St. Mary's Church, Halkyn, Flintshire. An antique woodcut engraving which was published in 'The Building News' on June 23rd, 1882. Photolithographed & Printed by James Akermann, 6, Queen Square, W.C. Vertical centrefold. Church of St. John the Evangelist (Welsh) Mold, Flintshire. An antique woodcut engraving which was published in "The Building News" on April 13th, 1879. John Douglas Architect. Photolithographed by Whiteman & Bass. The Estuaries of the Dee & Mersey. 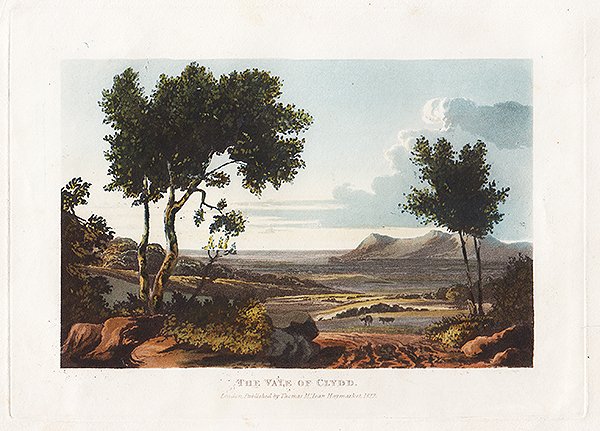 An antique aquatint engraving by T. Cartwright after E. Pugh. Published 15th March, 1814, with original hand colouring. 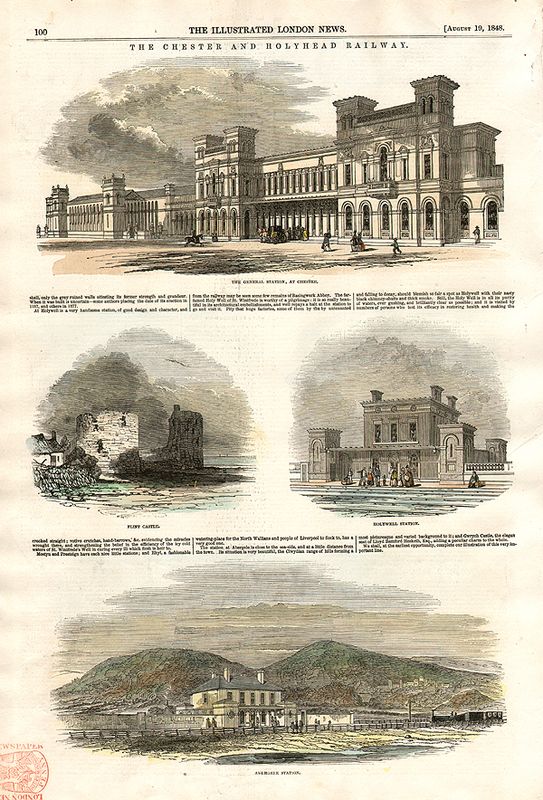 Antique woodcut engravings which were published in "Illustrated London News" on August 19th, 1848 with later hand colouring. Images include 1. General Station at Chester. 2 Flint Castle. 3 Holywell Station and 4. Abergele Station. Scene of the disaster on the Chester and Holyhead Railway, between Abergele and Llanddulas. More Info An antique aquatint engraving by F.Jukes from a picture by T.Walmsley. Published June, 12th, 1794 by T.Jukes No. 10 Howland Street. Original hand colouring. Dedicated "To Charles Browne Esq "This View of Overton Bridge is with greatest respect inscribed by his Obedient and Obliged Servants T.Walmsley and F.Jukes. " Excellent condition with very good margins. An antique aquatint engraving by F.Jukes from a picture by T.Walmsley. Published June, 12th, 1794 by T.Jukes No. 10 Howland Street. Original hand colouring. Dedicated "To Charles Browne Esq "This View of Overton Bridge is with greatest respect inscribed by his Obedient and Obliged Servants T.Walmsley and F.Jukes. " Excellent condition with very good margins. An antique line engraving after Henry Gastineau. Circa 1835. Later coloured by hand. 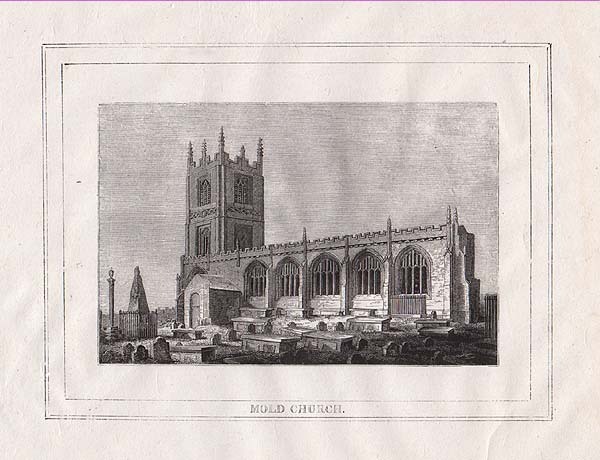 An antique line engraving by J. Boydell. Published by J. Boydell at the Unicorn of Queen Street, Cheapside, London. Circa 1790. Later coloured by hand. All margins trimmed very close to printed border and the print has been laid on later paper. An antique line engraving published by B. & J. White for Pennant's History of Whiteford and Holywell on January lst, 1796 . Later coloured by hand. This used to be a lighthouse in Roman times to guide ships from the Irish Sea into Chester. Whiteford Curch and Gelli Chapel. Antique line engravings by J. Barlow after Moses Griffiths. Published January 1st, 1796 by B. & J. White for Pennant's History of Whiteford and Holywell. Later coloured by hand. The Light - house on Point of Air, Flintshire. An antique aquatint engraving by William DANIELL from his greatest artistic work as an aquatint engraver, which is his book " A Voyage Round Great Britain" , which contains 308 aquatint prints. Published between 1814 and 1825. Original colouring. An antique lithograph by J. Bailey published by J. Evans. Circa 1860. 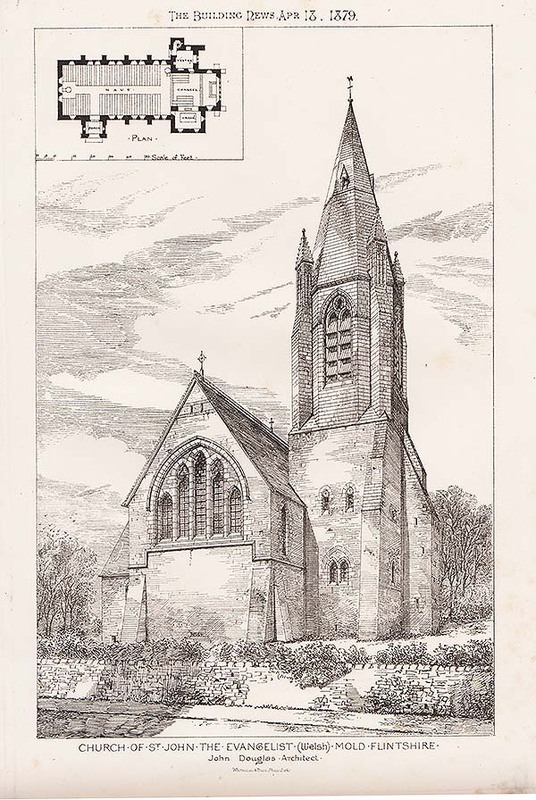 An antique line engraving sold by E. Langley, Borough. Circa 1830. Later coloured by hand. An antique line engraving by T. Jeavons after J.P. Neale. 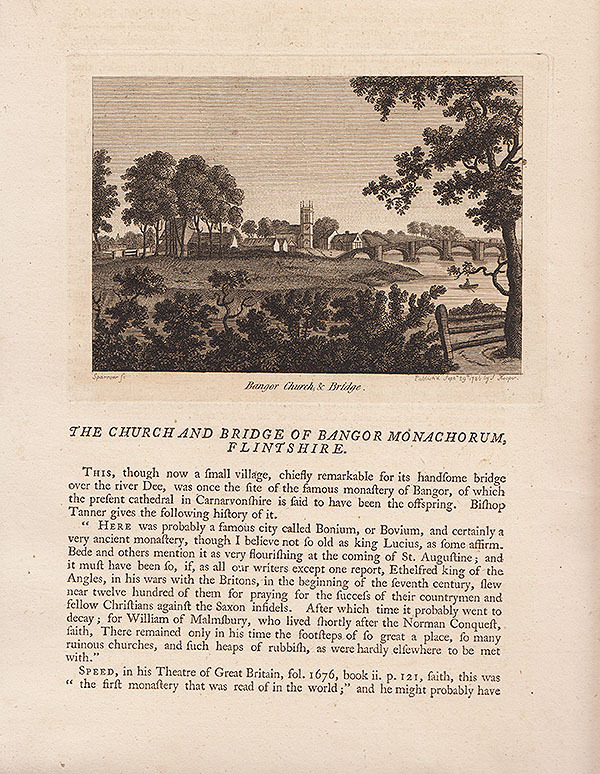 Published in 1824. Later coloured by hand. An antique line engraving by J. Baker after J.P. Neale. Published in 1824. Later coloured by hand. 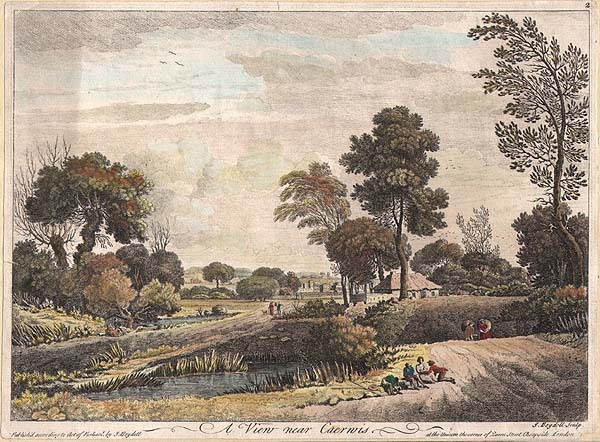 An antique aquatint by T.Cartwright after E.Pugh. 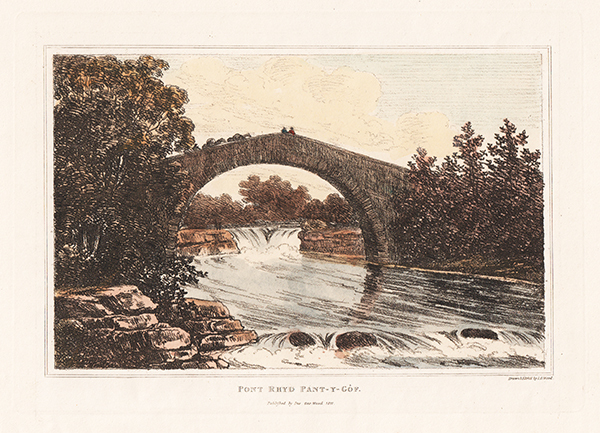 Published in 1813 with original hand colouring. An antique line engraving by Newman & Co. Circa 1860. The Riot at Mold, Flintshire : Attack on the Soldiers at the Railway Station. An antique woodcut engraving which appeared in "The Illustrated London News" on 12th June, 1869. An antique woodcut engraving entitled "Celebration of the 79th Birthday of The Right Hon. 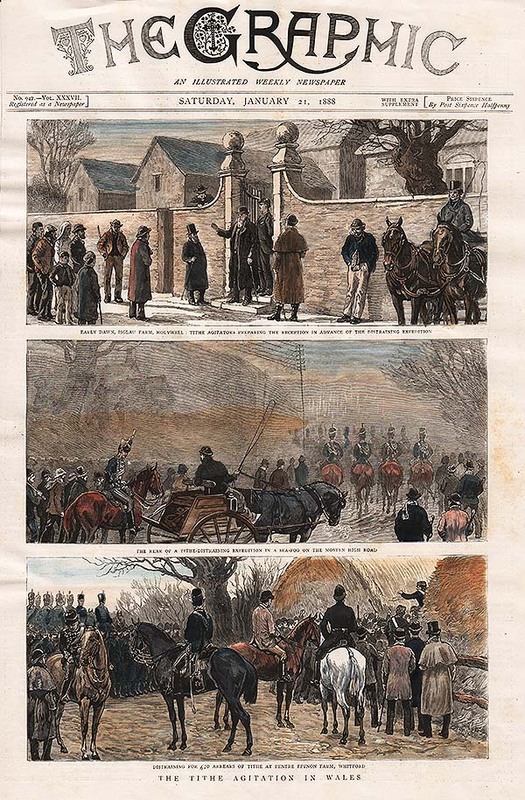 Lord Kenyon at Hanmer, Flintshire" published in "The Illustrated London News" on Auguat 13th, 1853. The colouring is later. An antique steel engraving after Henry Gastineau. Circa 1835. Later coloured by hand. An antique line engraving by S. Lacey after Henry Gastineau. Published in 1831. Later coloured by hand.